Each time we read a report, this question must ring in the back of our heads: can we measure how much this publication and the conclusions stemming from it will affect the state’s policy? No, we usually can’t. But it is equally true that there is always a two-way flow of information and opinions – better or worse, smaller or more extensive – between the policy makers and at least some of the experts. The opinions of the latter must be considered to carry some significance, even it is impossible to calculate its weight. Let me therefore focus here on one such report – a survey in fact – which, in my view, tells us a lot of Indian foreign policy. Thus, the survey included both analysts and policymakers (termed as “influencers” and “decision makers” here). The respondents were to answer 20 questions on India’s currently most important external and internal challenges. I will focus only on the foreign policy aspect here, however. Some of the survey results were far from obvious and call for further deliberations. Firstly: India’s strategic community perceives China’s actions, not Pakistan’s, as the main threat to the country’s security. 54 percent of respondents identified China’s assertiveness as “India’s biggest external challenge,” while only 10 percent chose “terrorism from Pakistan.” As much as 73 percent chose the China-Pakistan Economic Corridor (CPEC) as an occurrence which has presented India with a major security challenge (but there was no answer on terrorism here to choose from). In this case the respondents were allowed to pick more than one option, however, and the two other often selected answers were: the United State’ drawdown in Afghanistan (69 percent) and “China in SL [Sri Lanka]/Maldives” (63 percent). This would suggest that China’s growing influence in Pakistan, reinforced by a host of loans, is seen as a bigger threat in the long run than Pakistan’s actions towards India by themselves. The pre-eminence of CPEC in the survey baffled me first. In recent years Chinese overseas investment is surrounded with much hype: euphoria trumps realism, declared investments are often mixed really realized ones, and the fact that investment is usually based on loans eludes many commentators. But the last aspect – I may speculate – can actually explain why CPEC is a cause of even greater concern for India’s strategic community. The dependence on Chinese loans is growingly discussed even in Pakistan. This factor can be expected to provide Beijing with powerful leverage towards Islamabad and may facilitate such outcomes as the speculated turning of Pakistan’s Gwadar port into China’s naval base. In case this happens, India’s strategic community will turn out be correct in interpreting CPEC as a security challenge for New Delhi. At the same time, when asked about when “India is most likely to use military force overseas,” 44 percent respondents chose a “neighborhood intervention,” 43 percent a Pakistan conflict, 8 percent an international coalition, and only 5 percent chose a conflict with China (p. 16). Yet, expanding the military capabilities figured high on the strategic community’s top priorities. Asked to pick three (not just one) such priorities, the respondents often pointed out at those strengthening the armed forces: 49 percent voted for “naval/maritime capabilities,” 36 percent generally for the “military industry” and 11 percent for “nuclear/missile modernization” (p. 16). Secondly, the threat of Pakistani terror groups and India-Pakistan border tensions may appear underestimated given what India’s strategic community could be expected to think of these issues. But the Pakistan factor also appeared as an important aspect of New Delhi’s relations with Beijing and Washington. 31 percent respondents identified China’s ties with Pakistan as the biggest “obstacle to better relations with China” (the second most chosen option). As much respondents considered “U.S. relations with Pakistan” as the “biggest obstacle to better relations with the United States” (most chosen option on par with trade). Thirdly, the United States is perceived as India’s most important global partner by far. This was the choice of 75 percent respondents. Only 12 percent picked Russia (followed by Japan), thereby confirming the longer trend of weakening India-Russia relationship. If China’s assertiveness is India’s biggest challenge and the U.S. is New Delhi’s most significant global partner, what did the respondents think of Washington-Beijing relationship? “In the event of greater U.S.-China competition” 54 percent respondents suggested India should “remain equidistant,” while 43 percent chose the “collaborate more with U.S.” option. Only 2 percent voted for a more extensive collaboration with China. If the opinions of this section of the strategic community do aptly represent the reality of India’s international position, how could one translate such conclusions into future policies? Firstly, the experts and decision makers expect China’s growing influence to be a rising challenge in India’s neighborhood, but do not foresee this as leading to a direct, armed conflict. If this prediction is true, it should mean that from their perspective the policy makers in New Delhi should be working on influence contingency plans by finding ways to counter Chinese influences in other South Asian states (while not neglecting the aspect of military deterrence). The survey has shown that recent cases such as the Maldivian and Sri Lankan crises may offer templates for further Sino-Indian influence struggles in third countries. Secondly, the results suggest that the respondents unsurprisingly perceive Beijing’s economic prowess (and not military might, at least not yet) as a chief basis on which China’s influence in South Asian nations is growing. What New Delhi should be expected to do, therefore, is to search for tools to counter these economic forays, but this will be an uneven battle. India’s financial possibilities are outnumbered by those of China and, at any rate, New Delhi cannot counter China’s economic offensive in Pakistan in any way. The Indian experts and policy makers will surely think of future clashes in states such as Sri Lanka and the Maldives (but also Nepal, Bhutan and Bangladesh). What we can also expect to happen is a growing number of publications on CPEC in India (and on how it translates to China’s strategic position in the region). The reports and regular monitors of Chinese investment realized by certain American and European think tanks may serve as useful points of reference for Indian institutions. Thirdly, while India has managed, not without challenges, to keen an (uneven) balance between Russia and United States, it must continuously ponder in the importance of Washington-Beijing dynamics. 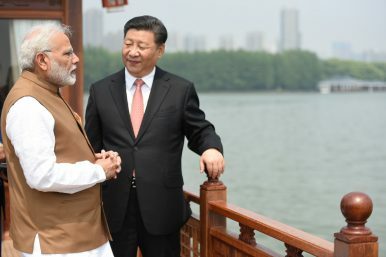 The survey suggests New Delhi should focus on defining its position and interests with regards to a number of issues that appear between the United States and China – the two nations which are not only most important globally, but which India’s strategic community has considered most significant for the fate of their country. New Delhi should be working on various scenarios that may unfold in relations between these countries, and on the stance India will take them if they will occur. As India joins the SCO, it must keep in mind certain geopolitical realities.